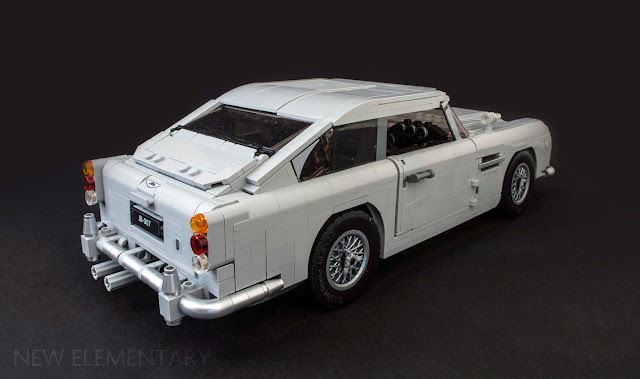 As if the unforgiving curves of the Aston Martin DB5 are not challenging enough, this model was given a second IP licence, the same that brought the car to fame. This meant its designer Mike Psiaki had to pack in as many Bond gadgets as it could fit and also mimic the car’s Silver Birch paintwork. While LEGO does make elements in two different shades of silver (sort of), I believe neither would work well in this model for technical and budget reasons which I will explain later. It ended up light grey which could be seen as a slight compromise on the car’s elegance. This doesn’t mean we don’t get a couple of sparkly new silver pieces anyway. The true genius of the model hides in the various gadgets and building techniques used to disguise them. One of the first great solutions was the front opening engine lid. 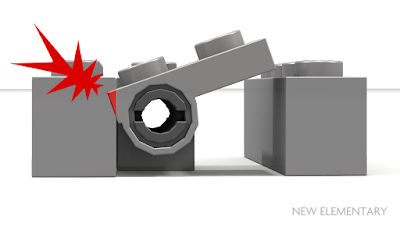 Normally it is difficult to hinge elements which are tightly and seamlessly surrounded by other pieces due to part collisions, as demonstrated in this image. Mike Psiaki has packed with the DB5 with tiny unorthodox building techniques that work so well (and clearly even got past Mr. Berard’s perceptive legal connection eye). It would take too long to list them all but I wanted to pay some attention to the design of the lower-rear of the model. The bumper is positioned to take advantage of a convenient gap formed between the curve of the inverted wedges and bricks. Making a transition to close that gap would be impossible, but using the bumper to disguise it gives the rear end an elegant curve and lets the bumper fit snugly against the body. A very satisfying symbiosis of elements working together. This assembly is exactly 4 plates high and looks very tidy from the outside. 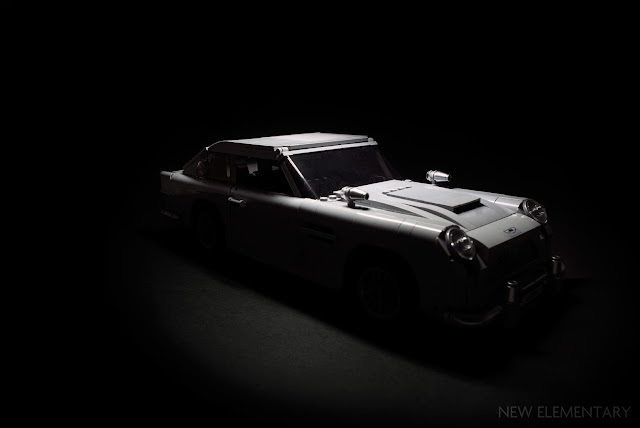 The model features almost every known gadget from the James Bond films down to the revolving dash radar and hidden telephone. Moving the gearstick back reveals the front machine guns as seen in the 1964 film Goldfinger where the guns are concealed behind the indicator lenses. The function works flawlessly and is immensely satisfying to play with. The rear bulletproof screen is activated by turning one of the exhaust tips. Another aspect of the ingenuity of the gadgets’ design is their minimal intrusion into the shape of the car. Incorporating all the levers and knobs to activate the gadgets in existing parts of the car would likely earn the approval of Q himself. 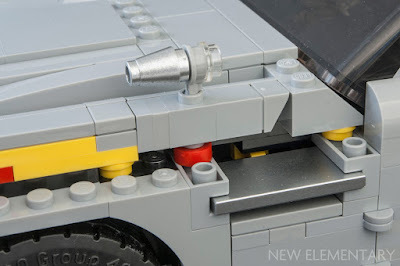 Both number plates can be turned by hand, and because there are no triangular, flat sided elements in LEGO, there are four different number plates to choose from. Such systems, most notably used for revolving traffic and advertising signs, use three-sided rollers to optimise the gap required to rotate, much like the hinge gaps mentioned earlier. However, the four-sided LEGO solution works surprisingly well. Finally, no James Bond DB5 would be complete without the most ridiculous car gadget in film history, the ejector seat. This thing is a work of art. The passenger roof segment hinges open by pulling a rear bumper section which also preloads the tension on the rubber bands for catapulting the seat out. It is a complex system of Technic wizardry that takes up the majority of space behind the front seats and still allows full structural integrity of the model with no gaudy seams visible on the outside. Good show! Generally, new moulds are not permitted for the LEGO Creator theme. This has changed in recent years but only for the Expert large vehicle models with an IP licence such as the 'quarter-doughnut' piece from 10252 Volkswagen Beetle. 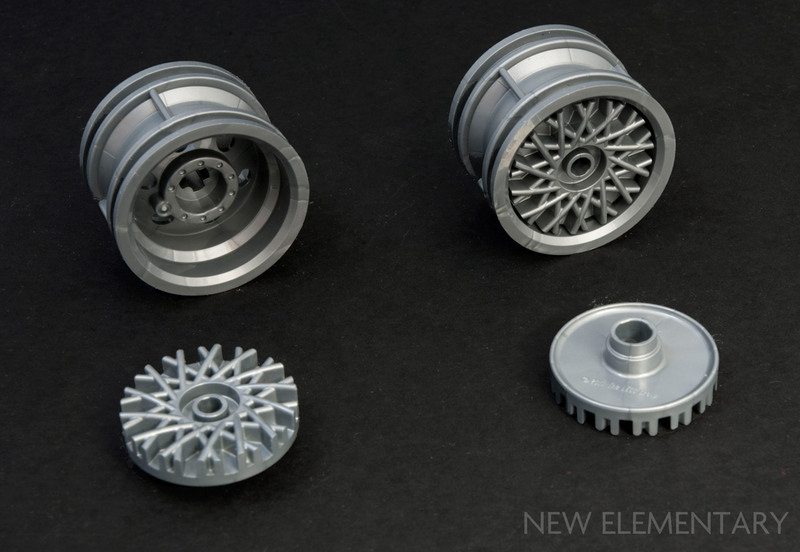 The brand new element in 10262 James Bond Aston Martin DB5 is the wheel mesh in Metallic Silver [TLG]/ Flat Silver [BL] (Element ID 6227156|Design ID 37195). It is a good universal spoked wheel design bound to find its use in many other vintage car models. In our recent review of 10261 Roller Coaster we found a new curved brick element, Brick Modified 1 x 2 x 1 No Studs, Curved Top in Medium Stone Grey [TLG]/ Light Bluish Gray [BL] (6227184|37352) but this new parts was actually introduced for the DB5, where it becomes the real star of the show. The design makes great use of 44 of this element. While anticipating this vehicle, I was silently hoping for some new metallised silver elements. Even if the car was going to be grey, I knew they had at least to make the trim silver to avoid it looking too flat. The colour names of silver elements can be confusing to a lot of people, so I wanted to get that out of the way first. Currently there are only two commonly used silver colours in the LEGO palette and they should be fairly easy to distinguish. 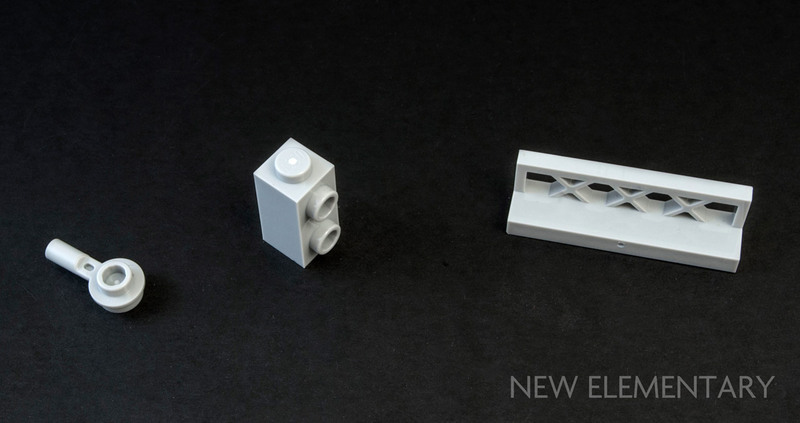 One is a silver pigment added to the plastic pellets before moulding, just like most other LEGO elements. Because silver and gold are not really colours, the fine particles responsible for the shiny appearance don’t mix homogeneously, which can result in a marbling effect on the surface. This side-effect is most noticeable on very smooth surfaces such as tiles and curved slopes, particularly around the injection point, which is probably why the colour is rarely used for such elements. TLG currently calls this colour Silver Metallic, a successor of the retired Silver (Colour ID 131). 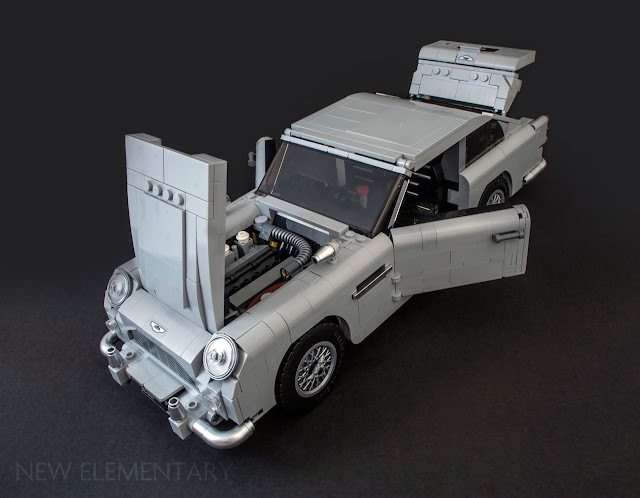 BrickLink calls this colour Flat Silver but some pieces end up in a retired colour category called Pearl Light Gray, using material shade tolerance as a dividing factor. Silver [TLG] / Pearl Light Gray [BL] was the first silver colour from the 1990s and, as with most LEGO colours, it changed somewhere after the transition from supplier BASF to in-house pellet mixing. 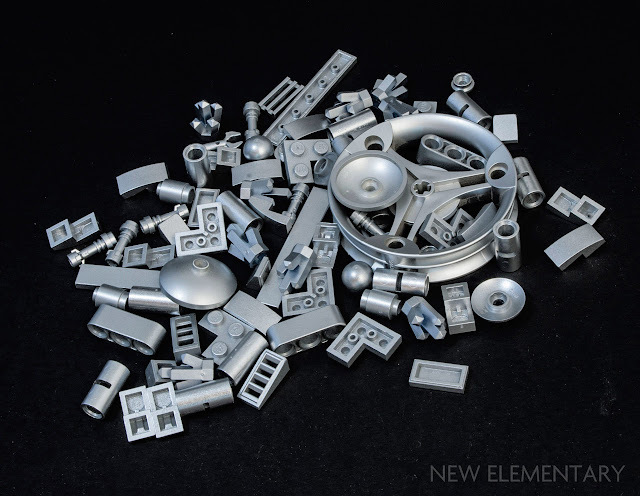 Because the colour was most extensively used in the Bionicle theme, which also used a softer plastic for many of its elements, some pieces may appear lighter – even after the change. This draws a blurry line between where Silver [TLG] / Pearl Light Gray [BL] ends, and Silver Metallic [TLG] / Flat Silver [BL] begins but according to set inventories, no new elements have been produced in this colour since 2009 at the very latest. 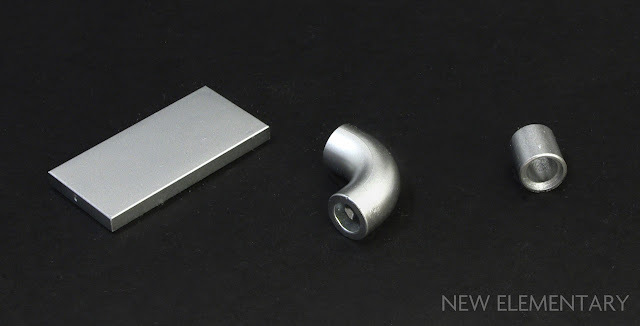 The other silver colour has a very reflective appearance with a slightly grainy surface, resembling anodised aluminium. 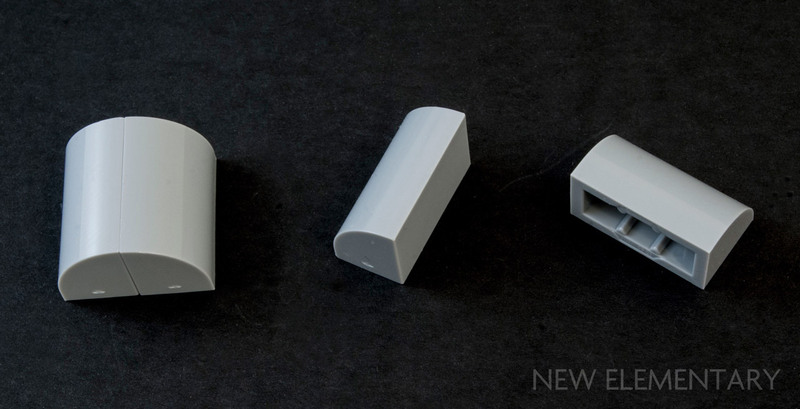 These parts are moulded in a base colour; either in Black or the default colour of ABS plastic which is called Nature [TLG]/ Milky White [BL]. These parts are more expensive to produce because they require a separate mould plus an additional layer applied to the plastic after moulding. It is not impossible that the pieces are painted, but they are more likely metallised. There are different techniques for metallising plastics like electroplating, vacuum metallisation or electroless plating. These are the most widespread methods of getting a consistent and durable silver coating on ABS plastic used in the car and consumer electronics industries. TLG initially referred to coated elements as decoration, not a colour. Today it is known as Silver Ink. Until around the middle of 2014 it was called Cool Silver, Drum Lacquered (Colour ID 298) - a name which may hint at the barrel electroplating process of bulk pieces. Another pointer to this process is that TLG uses different Design IDs for coated elements, which means they use a different mould to the element’s pellet-coloured counterparts. No changes to the appearance are noticeable after the name and code change, which makes this one and the same to us, end consumers. 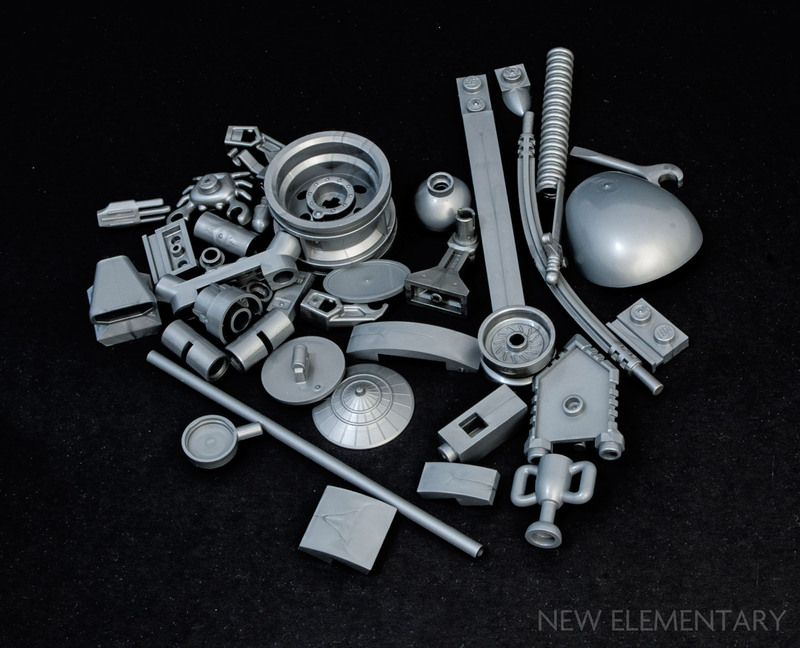 BrickLink consistently categorises this colour as Metallic Silver (not to be confused with TLG’s Silver Metallic). 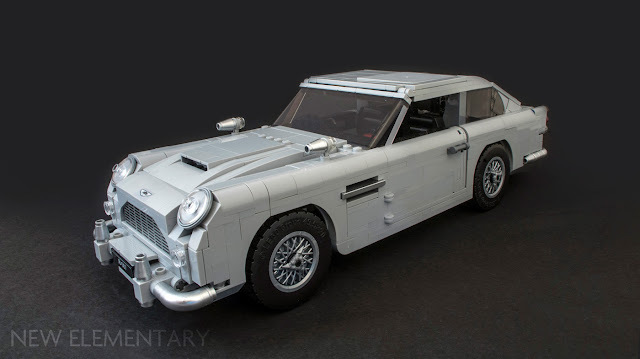 It is a rare colour in LEGO sets, first used in 1998 for Technic model rims and most widely utilised by the Agents theme in 2008. Unless you are into customising pieces or using old Scala chromed elements, it is the only option to add shiny trim to models. The DB5 introduces three new elements in Silver Ink [TLG]/ Metallic Silver [BL] and used four previously existing elements in this colour. 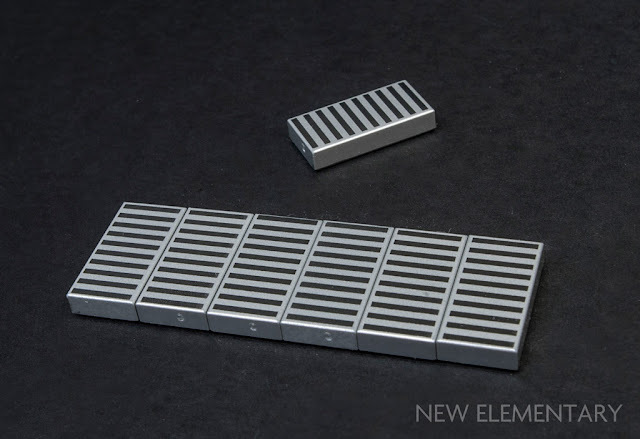 The new elements are Tile 2x4 (Element ID 6227939| Design ID 87079/38879*), Tube elbow (6228176|38896/25214*) and the 1L Technic Bushing (6227958|38882/18654*) – the latter being a very welcome addition to the already existing 2L version of the tube. *The second Design ID refers to the element’s non-metallised counterpart. The only other recolours in the set come in the car’s dominant colour. 1x4x1 Fence (6230229|3633) which only existed as a Q-element... before Q declassified it. There is one new printed element, a Silver Ink [TLG] / Metallic Silver [BL] 1x2 tile with black grille print (6242566|41781). It’s nice to get some variety on the old unprinted 1x2 radiator grille tile. In case you missed them, the non-printed metallised 1x2 Tiles were recently made available in the 42078 Technic Mack Anthem (Amazon USA). The rest of the decorated elements are stickers, as is common with Creator Expert vehicles. I don’t remember the last time I had this much fun building a set and then repeatedly taking it apart just to see how it works. The Creator Expert standard is set high, but I don’t expect every new model to be an educational experience in building techniques. Now that the Ideas platform tested the waters of the film-car fanbase, we might get to see more four-wheeled film stars in a scale that lends itself better to the detail they deserve. If Bond’s signature vehicle proves popular enough, I hold high hopes for eventually seeing a time traveling DeLorean in this scale. 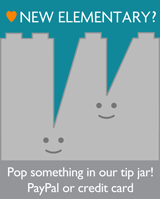 Help New Elementary keep publishing articles like this. You can send an amount of your choosing via PayPal or card by click the image on the right. Think of it as the price of an app, or a book, or a yearly magazine subscription – whatever we're worth to you, we'd be honoured to receive it. Products mentioned in this post were kindly supplied by the LEGO Group. All content represents the opinions of New Elementary authors and not the LEGO Group. Aston Martin, the Aston Martin Wings logo and model name DB5 are trademarks owned, licensed or used by Aston Martin Lagonda Limited. All rights reserved.
. All text and images are © New Elementary unless otherwise attributed. Really great review. I'm not 100% sold on how it looks, but I want lots of the new parts. I'm really on the fence on this one, as while the features are nice, I really think the designer did not capture the elegant lines of the real car. It really looks like a toy or Lego design from 20 years, Lego succeeded in making a beautiful car into an ugly Trabant. Wonderful review and breakdown, and I love seeing your infectious enthusiasm for not just the result, but the experiential process of building sets like these. I LOVE these articles. Love the gifs of it working! Great write up as usual, Tim! Excellent writeup, thanks! I love all of the functional mechanisms in this build. For the silver parts, electroplating is right out because you can only use that process on conductive metals, due to needing to run a current through the part you're plating. I'm pretty sure these are not produced using any sort of immersion bath, as the coverage, while pretty good, is still inconsistent like the chrome parts (undersides of parts are often skipped, though we've yet to see a minifig with voids on the side of the torso where the arms were positioned during the paint application. The even coverage on the external surfaces suggests they might be powder-coated or something along those lines. And my experience regarding the base colors is entirely different than yours. I think they used black for some of the Fantasy Castle armors and helmets with the speckled finish, but the only color I've seen them use for metallic silver finish or silver chrome is light-bley, and tan is used for metallic gold and gold chrome. The reason for this seems to be that if the finish gets scratched deeply enough for the base color to show through, using a color that's a fairly close match means the scratch won't show as badly. It's kinda like picking thread color so it won't show up against the material when sewing. The specific incident that caused me to notice this was when I tried cleaning some Pere Marquette soot off some metallic silver parts and I ended up scrubbing most of the paint off (chrome requires a fairly robust sealer to protect the thin layer of metal coating the object, which is another reason I think metallics are just painted). All of those parts were clearly light-bley underneath.